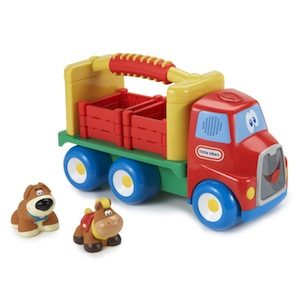 The perfect take-along friend, this fun "first truck" has its own face and personality to promote imaginative play and storytelling. Press the button on the truck cab to hear a song and animal sounds. Includes removeable animals and pens for added play. The unique soft-grip handle makes toting this special friend everywhere easy. Chunky design and six wheels offer stability during knee play. Batteries included. Replace with 2 "AA" alkaline batteries (not included). Ages 1 to 4 years.